Aquajet Systems AB, a global leader in hydrodemolition machine manufacturing, introduces the Ergo Climber attachment for its new Ergo System hydrodemolition robot. The Climber attaches to any standard scaffolding pipes and robotically moves along them to deliver powerful hydrodemolition forces for systematic vertical concrete or refractory removal, such as high-rise construction, petrochemical facilities, and other industrial applications. The Climber’s roller beam and hydraulically synchronized left and right climbers robotically move and position the attached Power Head, directing the water jet to remove concrete from areas 9.8 in. to 6.6 ft wide. Aquajet’s high-pressure Power Pack provides the required water pressure and flow. The Ergo System’s controller unit powers and controls the hydraulics. It uses intelligent sensing to allow the operator to program the lance for optimal material removal. The Power Head oscillation is adjustable to 8 or 14 degrees. The lance angle is modifiable up to 45 degrees. The combination results in contractors being able to remove as much as 9 cubic feet of concrete per hour. Aquajet Systems designed the Climber with spring-loaded, high-friction rollers that connect to a lightweight roller beam with just one bolt. Contractors attach the all-wheel drive system to scaffolding pipe with two spring-loaded handles — one for the right and one for the left. The system offers a better grip and aids in the consistency of movement. Safety latches secure the handles in the locked position. The Climber travels well over most types and condition of pipe, including bent pipe, pipe joints, aluminum and steel pipe. Operators can arrange scaffolding to maximize the Climber’s effectiveness in a variety of applications. Beyond the simplicity of the single-bolt connection, the Ergo Climber weighs just 48 lbs and can be carried by one person, making it easier than ever for a contractor to add hydrodemolition services to their offerings. 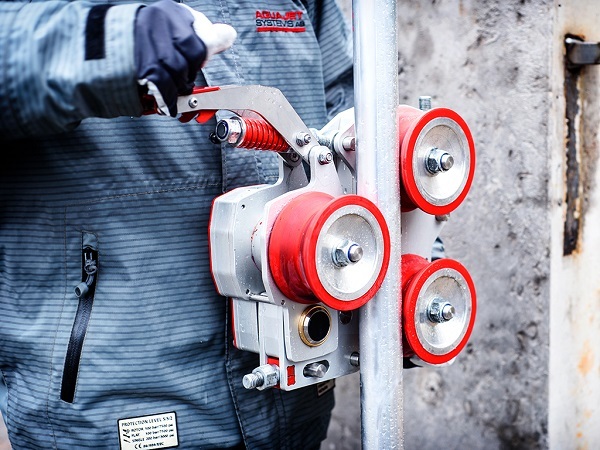 In addition, the Climber system’s power head features interchangeable parts with the Ergo Spine and operators can use the Spine roller beam with the Climber, improving convenience for contractors who own both systems. Click here for more news from Aquajet Systems!